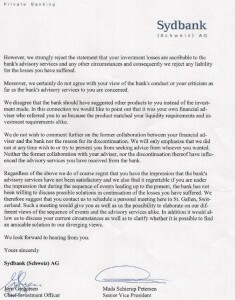 Sydbank has always denied having collaborated with Nykredit on distributing a tax evasion product from Switzerland and Marbella, and Nykredit has always said that “they were only the lenders” and had no association whatsoever with Sydbank, other than the happy coincidence that British retirees happily living on the Costa del Sol introduced them to each other. As compulsive-lying Nykredit henchman Frederik Meding put it, Nykredit Realkredit A/S only provided the mortgage which your clients chose to use for investment. Or more appropriately, Morten Larsen and Kennet Nissen, from Sydbank in Aabenraa stated, the bank has not been involved in Nykredit A/S mortgaging of your clients’ properties and Nykredit has not been involved in the investment advice provided by the bank to your clients. Furthermore, Frederik (who shokingly has not yet been sacked for allowing his firm to operate jointly with a clandestine firm, in Spain) added, as if to show his firm grip on all law matters whether EU/Danish/Spanish-you-name-it, that it is important for me to state that Nykredit is not a party to or otherwise involved in the investment service provided to you by Sydbank AG. Hence Nykredit is not in a joint venture or other kind of partnership with Sydbank AG. It is at this point where one wonders whether lying is endemic to bankers or, more particularly, Danish bankers. The article, currently posted on Sydbanks’ website, states completely the opposite. Who is therefore lying? Sydbank or Sydbank, Nykredit or Nykredit? Sydbank has developed mortgage offer in cooperation with Nykredit. In Nykredit we look forward to expanding the cooperation with Sydbank financing solutions to private clients in Germany. Based on experience with the financing of private homes in France and Spain, we can now offer our Nykredit Danish Mortgage to Danish and German Sydbank customers, says deputy director Erik Urskov, from Nykredit. 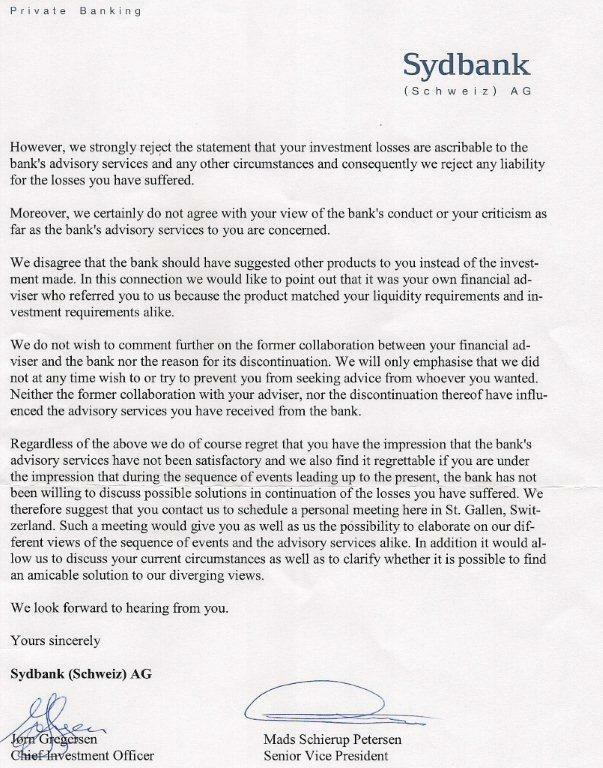 Undeterred by the scandal that hit the press in Denmark 1 year ago which meant, among other things, the closing down of Sydbank Switzerland (to presumably prevent further reputational damage), Sydbank Denmark’s lawyers in Spain are still convinced their customer did nothing wrong and so, have offered a meagre 40% of the portfolio losses to their victims/customers, leaving out of the base to calculate compensation mortgage payments, costs, legal fees etc. Naturally, the offer was promptly rejected. Opened an office in Fuengirola without letting the Bank of Spain know. Offered British customers a perfectly sound and legal Inheritance tax “avoidance” scheme, in partnership with Nykredit, whereby unencumbered properties would be mortgaged with a loan offered by the latter, the proceeds being dispatched to a Swiss account held by a Belize-based offshore company, all of it devised, arranged and managed by the former. Used an unregulated IFA based on the Coast. Denied having offered an Equity Release Scheme with Nykredit. Denied any relationship with Nykredit, alleging that it was the borrower who contacted both, separately. Denied having had a contract with any IFA on the Coast, blaming the customers for “hiring” the IFA. Confirmed that if Inheritance Tax was the purpose of the contract, it would have been the customer’s motivation and not the bank’s. Sydbank is the worst Equity Release offender, by far, in terms of lack of regulatory compliance for the laws in Spain. Never registered in Spain, at all, to provide any service, banking or otherwise. Opened office in Fuengirola without authorization. Used unregulated unqualified agents to capture customers. Sold tax-cheating products pretending they were fully regulated for Spain, when this was totally untrue. Offered customers Belize-based companies to conceal the investments from the Spanish authorities, a la Lord Ashcroft, operating from the Sydbank Switzerland base, but made it out to be that it was the customer who was instructing the bank to do so. All of this has already cost them dearly: the Sydbank branch who signed the attached last page of the risible missive was closed down following the spate of damning articles, openly accusing the entity of tax evasion, published in the Danish press. It is with profound regret and sadness that the ERVA has to announce the death of D.T., a member of our association. D.T. and his wife J.T had taken a complex equity release product through Nykredit and Sydbank, via the company Offshore Investment Brokers (OIB) in the belief that it would help, lawfully, alleviate death duties whilst providing an income stream, to complement their pensions. OIB was not regulated to operate in Spain. Sydbank had never applied for authorization to operate in Spain. Nykredit was the lender while Sydbank managed proceeds of the loan. Losses on the portfolio had risen to 60% and they faced losing their home, previously unencumbered. The death of Mr. D.T., according to the doctors, had been caused from a cerebral aneurysm precipitated by high blood pressure, a condition directly related to psychological stress. The couple were residing in Mijas. At ERVA we would like to thank D.T. for all his support. Our deepest sympathy goes out to his family. May his memory be eternal.